A public meeting is called in any locality where a Penny Bank is sought to be established; a number of individuals consent to act as directors or managers; from these are chosen a secretary, treasurer, and trustees; each director to preside in turn at the Bank to transact its affairs, and the deposits are placed out at interest in an ordinary Bank, by the treasurer, in the joint names of the trustees, for the benefit of the depositors. Various by-laws and rules were enacted locally to determine operating hours and when withdrawals of funds would be permitted. 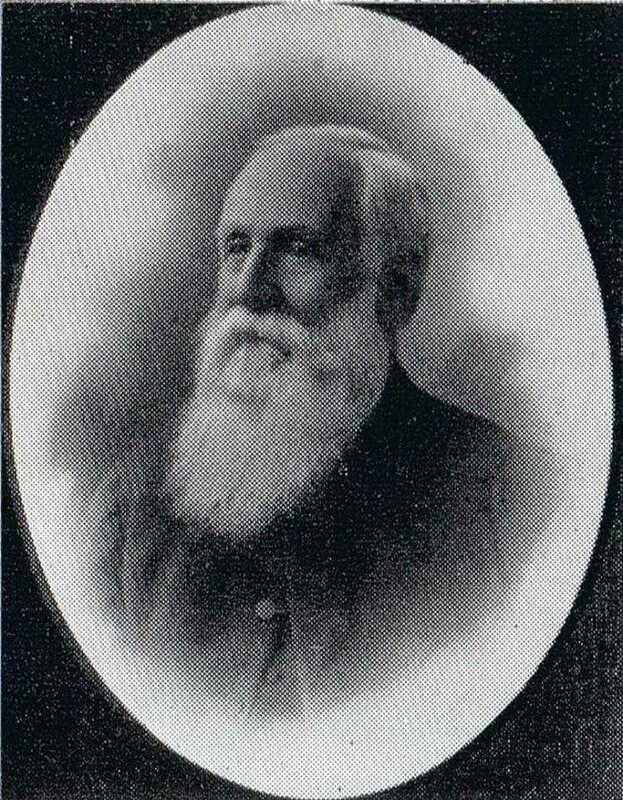 The Rev Charles F D Priddle (1824-1897), the incumbent of St Luke’s Liverpool NSW, was largely responsible for the initial promotion of PBs in NSW. 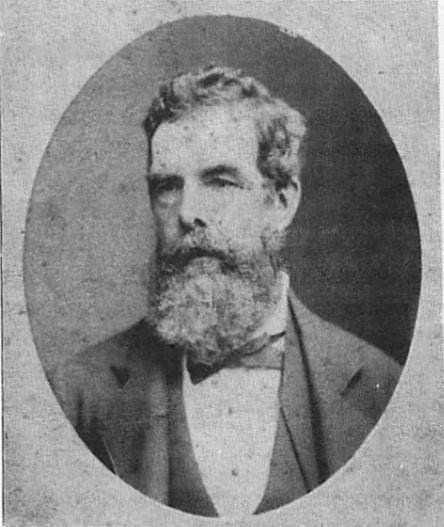 A number of newspaper articles on English PBs had been published in the colonial papers, but Priddle was the first person in NSW to commence such a bank. He was born in England and came to NSW, aged 20, with his parents and siblings arriving in January 1845. He studied for the ministry of the Church of England at St James College, Lyndhurst (Glebe) and was admitted as a Deacon in March 1848 and Priested in December 1850. Initially, he was appointed to officiate at St James King Street, Sydney, assisting Rev Robert Allwood and in 1855 was appointed to take charge of St Luke’s Liverpool. Every Monday [Saturday] evening, punctually at seven o’clock, Mr Lane or I take our seats in the reading-room, for the purpose of receiving deposits and making payments … Each depositor, after having been registered, is furnished with a pass-book, in which his periodical payments are entered. This of course, he retains possession of himself. In the pass-book stands his initials and number, corresponding of course with initials and number in the ledger. It is an important protection against fraud only to put the initials in the bank or passbook, for should Mary Jones (for instance), lose her book a finder of it would not know what M.J. stood, for, and so could not draw the money. The bank shall be open to receive deposits from one penny upwards, as follows Saturday, from 7 till 9 in the evening. For paying out money, the same hours. Books into which all deposits shall be entered, will be issued to every depositor on payment of one penny. No money will be received or paid unless the book is produced. Deposits may be withdrawn on any Saturday evening provided notice has been given on the previous Saturday. Depositors may at any time during bank hours, have their pass books compared with the ledger to test their accuracy. Any depositor requiring a second book, in consequence of the first being lost or spoiled, shall pay two pence. Depositors should on no account write their name or address on their passbook; and if they lose it they should give immediate notice to the bank, as the directors will not be liable under any circumstances for more than one payment of a deposit. That an account shall be opened at the Sydney Savings Bank, to which the moneys arising from the deposits shall be paid. Every person connected with the management of the bank considers himself bound in honour to silence and secrecy respecting the deposits. Every possible arrangement is made with a view to privacy. wherever they have been set on foot in such a way as to secure the confidence of the handicraft classes, is a proof how deeply their value is felt. And if only penny banks were as plentiful as they should be, and as fully used as they should be, there would be far less need of those numberless charitable institutions, refuges for the destitute and infirm; and the elevation of the masses in the scale of respectability and comfort would be secured. It would appear that Priddle had had no personal experience of a PB upon which to draw and his approach and views were derived by reading literature from “Home” such as that written by the Rev J Erskine Clarke, Vicar of St Michael’s Derby, whom he quoted saying that ‘There is no greater boon that the clergyman or squire of a village can confer on his neighbours, than the establishment and superintendence of a penny bank’. In 1860, a PB was established at Campbelltown to be followed with the opening of at least fifteen banks in 1861. During this period, Priddle was in demand as a speaker telling the story of the PB and how one might commence one and often, after his lecture, a decision would be made to open a PB. In December 1861 and due to public interest, Priddle published his lecture on PBs which was entitled Penny Banks : A Lecture with Directions for Their Establishment. The PBs were popular but their activity levels varied from location to location and over time, but it seems they were well patronised. 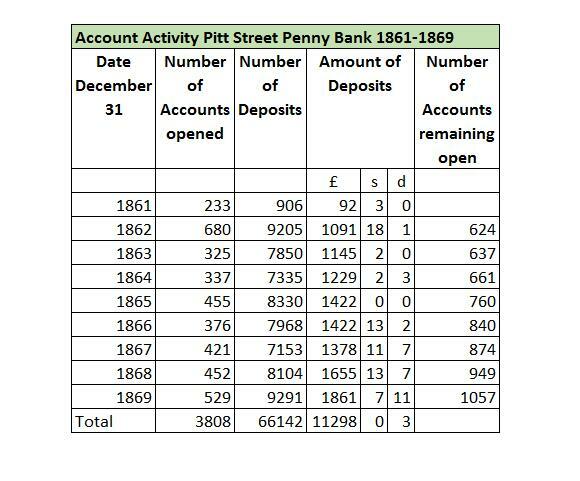 The Pitt Street Congregational Penny Bank (PSPB), as an example, was well organised and was reported on thoroughly in the newspapers which allows its activity to be examined. Its activity level is revealed in Figure 1. At the end of the PSPB’s first full year of operation, 624 accounts had been opened with 9,205 individual deposits made and £1,092 deposited. Generally, the PSPB was open 50 times a year, every Friday or Saturday evening and with a short break at the end of the year. Given the number of deposits recorded over the period of the table in Figure 1, the PB would need to process on average about 160 separate transactions every day that funds were received and this does not take into account the processing of withdrawals. In order to deal with this workload and the crowding it produced in the banking room, additional volunteer cashiers were used to receive funds and make ledger entries. Even so, a heavy workload, unpaid, fell upon the volunteer bank secretary who was John G Marwick. The level of activity for which a volunteer staff was responsible was unsustainable and eventually Marwick, the principal worker resigned and no one could be found to replace him in his sacrificial and philanthropic role and the bank was forced to close. In 1886, such was the popularity of the concept of the PB as a means of teaching children the habit of saving for an unknown future that the Department of Public Instruction Under Secretary, Edwin Johnson, most probably with the concurrence of his Minister, Dr Arthur Renwick, circularised Public School teachers to encourage the formation of PBs in connection with their schools. The PB was seen as ‘a remedy to meet the serious evils of improvidence and want which often press heavily on the industrial classes’ by promoting in the training of children by the use of the PB of ‘self-restraint, self-reliance, foresight, and thrift’. Such PBs became widespread and by 1895 were in 631 schools with 37,000 depositors having £6,049 to their credit. The records of the existence of particular PBs are fragmentary with the main source of information being the annual deposit balance reports in the Government Gazette from 1866 to 1912, newspaper reports and advertising. While these records are fragmentary and incomplete, as undoubtedly many unreported local small penny banks existed, certain trends can be discerned. Many banks served their communities for long periods of time, Figure 2 is a list of 31 banks which operated for 10 years or more and 12 of them managed to continue to operate for more than 20 years. 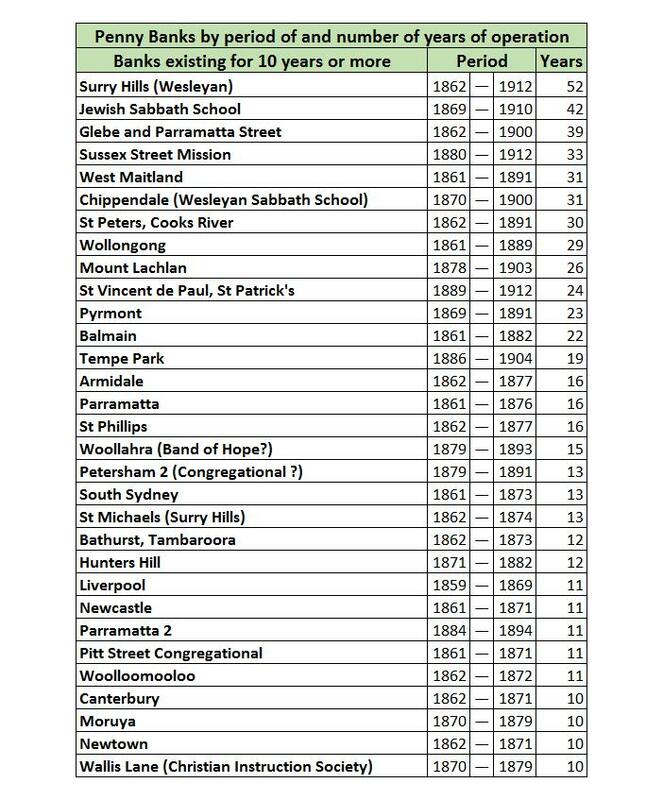 In the period under review, 1859 until 1912, the longest-serving PB was that at Surry Hills Wesleyan which operated for at least 52 years and possibly longer. By 1912, and for a few years prior to that, it was barely operating but the figures can be misleading. According to end of year balances recorded in the Government Gazette, the Balmain PB, for example, begun in 1861, continued to operate until 1907 and was, on these figures, the second longest existing PB. In actual fact, with the death of the Secretary and Treasurer H E Tidswell (pictured) in October 1882, the bank was closed and depositors asked to withdraw their funds. Many did so, but not all, and so the balance of funds held dropped from £2609 in 1882 to £322 in the 1883 report. It is evident that a significant balance of depositor’s funds remained unclaimed from this closed PB until 1907 when the balance was no longer published. Similarly, the Chippendale PB was commenced in 1870 and still showing a balance of £15 in 1912 when it had actually closed in 1900. This entailed considerable extra work on the secretary; but his most trying time was the annual balancing, when to discover some trifling difference he night after night (after his usual daily duties were over) had to check thousands of entries and add up hundreds of accounts to find it out. This, at the end of nine years, so seriously affected his health that he was reluctantly compelled to resign, and which, unfortunately, proved the death knell of the bank, owing to the directors (who comprised the Rev John Graham, David Jones, George A Lloyd, James R Fairfax, and Joseph Thompson) being unable to get another to take his place. In the case of the closure of the Chippendale Wesleyan PB the secretary fraudulently obtained £12 14s from the bank. This event may have shaken the confidence of contributors, or the desire of the Trustees to continue, or the ability to attract another secretary, as the balance of funds held dropped from £484 to £33 and the bank closed in 1900. In 1871-2 several banks closed (Ashfield, Canterbury, Goulburn, Holy Trinity, Newcastle, Newcastle Band of Hope, Newtown, Picton, Pitt Street, St Francis, Waterloo and Woolloomooloo) possibly due to a range of factors, but the timing suggests that the Government Savings Bank being opened in October of 1871 was the main factor. The St Michaels Surry Hills PB closed in 1874 and explicitly said that its closure was due to the opening of a branch of the Government Savings Bank in the suburb. It would appear that unclaimed balances upon the closure of a PB were a problem. In 1875, the Petersham PB transferred such accounts to the Government Savings Bank. The Glebe and Parramatta Street PB closed in 1900 with a balance of £138 4s 5d and in 1902 the Trustees donated a sum of £140 12s 8d to the Ragged Schools which must have been the amount of the unclaimed balance upon the bank’s closure. Presumably, Trustees took the same course of action as those of the Woollahra Band of Hope Penny Savings Bank, begun 1879, when it declared that after a certain date in 1893 claims would not be recognised. At that date, this bank had an unclaimed balance of £8 which presumably was disposed of by the Trustees to some charitable cause. The graphic (Figure 3) indicates the progress of PBs in the period 1859-1912. Here it may be seen that in terms of the number of PBs from their commencement in 1859 up to 1870 some 35 banks were formed. 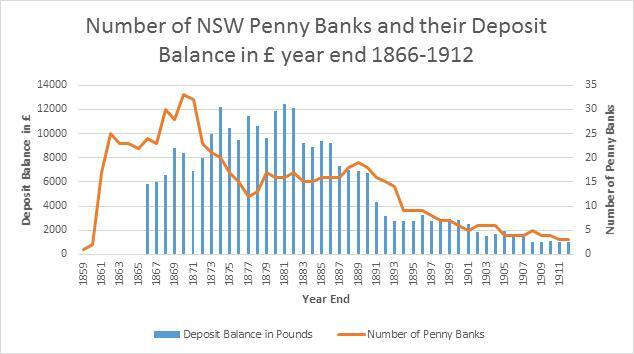 1861 was the year that the concept of the Penny Bank became very popular in NSW with some 15 being commenced. After 1871 until 1877, the number of banks went into steep decline with some 60% ceasing operation. The decline was largely due to the Government opening Savings Banks which were often accessed through the local post office. It may be that philanthropist fatigue had also set in and there were not sufficient people available to run the PBs and in the changed banking circumstances they were not considered worth the effort. The number of banks remained fairly constant at around 18 from 1877 up until 1891 when numbers again went into a decline from 20 in 1890 to 4 in 1912. In terms of funds held by the banks, those funds gradually increased from £6,000 in 1866 to £12,000 in 1882 and then declined to £3,000 by 1892 with a continued decline from then until 1912 when PBs held less than a £1,000. There was not a decline in the deposits held to parallel the decline in PB numbers between in 1871 and 1877 for the funds held by closed PBs were transferred to the Government Savings Banks. The decline in funds held and the number of PBs operating after 1890 was no doubt due to the recession which was experienced at that time. The clientele of the PBs were to be workers who were poor and particularly children. Some banks derived their support and clientele from existing organisations such as Pitt Street Congregational, Jewish Sabbath School, Chippendale (Wesleyan Sabbath School), City Mission and Bethel Mariners. Other PBs utilised an organisation’s membership for administrative support but their clientele was from the community, for example, Liverpool, Sussex Street Mission, while others were stand-alone community organisations whose clientele and support was community-based such as Glebe and Parramatta Street, Bathurst, Orange and Wollongong. The administrators of the banks were volunteers who freely gave of their time and often paid for the setting up costs. Each PB was to have a committee or trustees who were responsible for the running of the bank. The members of the committee of the Wollongong PB are a good example of those who undertook responsibilities within a PB. They were all, like those of other PBs, prominent and well-known male members of the local community (See Figure 4). Wollongong boasted four JPs on its governance committee and the organisational structure and public face of the PB was somewhat more impressive than was usual, but it was one of the banks that had considerable longevity lasting some 29 years. Probably Francis Sempill, the Secretary and Treasurer, was a key to its success as he was an employee of the Commercial Bank and an initial enthusiastic and energetic promoter of the PB. The PB system, with Trustees and Committees of prominent citizens as used in the colony of NSW, did not ensure PB longevity but it did avoid closures with the loss of the funds of contributors such as occurred on one occasion in England. In contrast to the organisational structure employed in NSW was that of a PB in Needham Market, Suffolk. In 1904, the PB of Needham Market Suffolk stopped payment and closed when its principal organiser, a Mr Maw who had been manager also of the local branch of Barclay’s Bank, was bankrupted. It turned out that there were no trustees, no committee, no constitution of the Bank and all depositors were regarded as Maw’s creditors. The bank had operated in this manner, of a single principal organiser with no public oversight, for over 40 years. The idea of the PB was to assist and encourage the poor, both children and adults, to save and by opening accounts to gain access to interest on their money through the PB Trustees investing it in a Savings Bank. These PB were popular with civic-minded people who organised them as it encouraged self-reliance in those who were poor. They were also popular with those who deposited their pennies as it provided some degree of insurance for their future. The PBs were, however, labour intensive activities that depended upon the continuing goodwill of philanthropic volunteers to be able to give their time to this work. When a willing Secretary who would give of their time gratis was no longer available a PB would often be forced to close. The opening by the government of Savings Banks at Post Offices in 1871, and with their continued expansion, led many philanthropically minded volunteers to recognise that the need for this service had largely passed in their district and so they closed their PB. Those PBs that had a long life were usually linked to a community of interest such as the Wesleyan Church or the Jewish Sabbath School for these provided both a pool of willing workers and depositors. The adoption by the Department of Public Instruction of the PB concept for inclusion in its school program ensured the continuance of the idea which in this form persisted well into the second half of the 20th century. Francis Burdett Annals of Banks for Savings: Containing an Account of Their Rise and Progress; Reports and Essays on Their National Importance (London, 1818), 14, 63. Duncan M. Ross, ‘’Penny banks’ in Glasgow, 1850-1914,’ Financial History Review 9,1, (2002): 25. Francis Burdett, Annals of Banks for Savings, 58-60. Francis Burdett, Annals of Banks for Savings, 9, 17, 63-66. The Woollahra Penny Bank, 1. Priddle, C. F. D. Penny Banks: A Lecture with Directions for Their Establishment. (Sydney: Printed by Joseph Cook &, 1861), 4. The Woollahra Penny Bank, 4. Adelaide Observer (Adelaide, SA), April 24, 1858, 1. Toowoomba Chronicle and Queensland Advertiser (Toowoomba, Qld), August 8,1861, 4. Empire (Sydney, NSW), December 14, 1859, 4. Geelong Advertiser (Geelong, Vic), January 6, 1862, 2. Launceston Examiner (Launceston, Tas), August 28, 1862, 5. The Australian (Sydney, NSW), March 24, 1848, 3. Colonial Times (Hobart, Tas), January 15, 1850, 3. The Sydney Morning Herald (SMH), March 20, 1848, 2. SMH, August 3, 1855, 5. Perhaps Priddle meant Saturday not Monday as the rules of the Liverpool Bank indicate. Maitland Mercury and Hunter River General Advertiser (Maitland, NSW), November 23, 1861, 9. Maitland Mercury and Hunter River General Advertiser (Maitland, NSW), November 23, 1861, 9. The Newcastle Chronicle and Hunter River District News (Newcastle, NSW), December 4, 1861, 1. SMH, October 31, 1861, 8. Quoted in Penny Banks for villages and small towns. Guide for their formation and management both as branches of larger penny banks, and under the New Post Office Savings Bank Act … By the honorary secretary of the Gloucester Penny Bank (London: Longman and Green, 1861) 1. Illawarra Mercury (Wollongong, NSW), December 25, 1860, 2. Priddle, C. F. D. Penny Banks : A Lecture with Directions for Their Establishment. (Sydney: Printed by Joseph Cook &, 1861). Empire (Sydney, NSW), February 21, 1863, 5. Empire (Sydney, NSW), February 16, 1864, 5. John Garrioch Marwick (1834-1908) was born in Kirkwell, Orkney Islands, Scotland. SMH, August 10, 1908, 6. Clarence and Richmond Examiner and New England Advertiser (Grafton, NSW), June 7, 1887, 4. A copy of the draft regulations can be seen at Northern Star (Lismore, NSW), January 12, 1887, 4. Truth (Sydney, NSW), December 29, 1895, 4. It is evident the Government Gazette figures are not an accurate measure of the active life of the PB as many PB retained funds long after they had ceased operating. This bank had a balance in the Savings Bank of NSW until at least 1914. However, this may have been a balance of unclaimed funds and possibly the PB actually closed around 1908 when the balance held was substantially reduced. Henry Earnshaw Tidswell (1820-1882) of Tidswell, Wilson and Co, Wine and Spirit Merchants. SMH, October 24, 1882, 1. Evening News (Sydney, NSW), October 24, 1882, 1; SMH, March 14, 1883, 2. SMH, May 26, 1900, 3. Sydney Mail (Sydney, NSW), May 21, 1870, 5. The Sydney Mail and New South Wales Advertiser (Sydney, NSW), December 9, 1903, 1543. Evening News (Sydney, NSW), December 28, 1899, 7; New South Wales Government Gazette (Sydney, NSW), February 2, 1900 [Issue No.99], 950; February 1, 1901 [Issue No.87], 728. The Daily Telegraph (Sydney, NSW), October 6, 1900, 15. Some of these closures were announced in advertisements and some are suggested due to there being no further mention of these banks. New South Wales Government Gazette (Sydney, NSW), September 22, 1871 [Issue No.232], 2117. SMH, February 28, 1874, 8. SMH, December 7, 1875, 2. New South Wales Government Gazette (Sydney, NSW), February 1, 1901 [Issue No.87], 728. The Australian Star (Sydney, NSW), September 23, 1902, 7. SMH, July 19, 1893, 1. Illawarra Mercury (Wollongong, NSW), October 4, 1861, 3. Illawarra Mercury (Wollongong, NSW), October 4, 1861, 2; October 11, 1861, 2. Empire (Sydney, NSW), April 12, 1858, 5. New South Wales Government Gazette (Sydney, NSW), February 19, 1869 [Issue No.37], 456. Illawarra Mercury (Wollongong, NSW), November 29, 1878, 2. SMH, May 3, 1869, 1. New South Wales Government Gazette (Sydney, NSW), April 26, 1859 [Issue No.72], 914. New South Wales Government Gazette (Sydney, NSW), April 26, 1859 [Issue No.72], 913. Empire (Sydney, NSW), July 25, 1861, 5. Illawarra Mercury (Wollongong, NSW), April 26, 1864, 2. New South Wales Government Gazette (Sydney, NSW), May 25, 1860 [Issue No.98], 997. Illawarra Mercury (Wollongong, NSW), November 20, 1866, 2. World’s News (Sydney, NSW), December 31, 1904, 4. By phinaucohi in Philanthropy on June 23, 2018 .